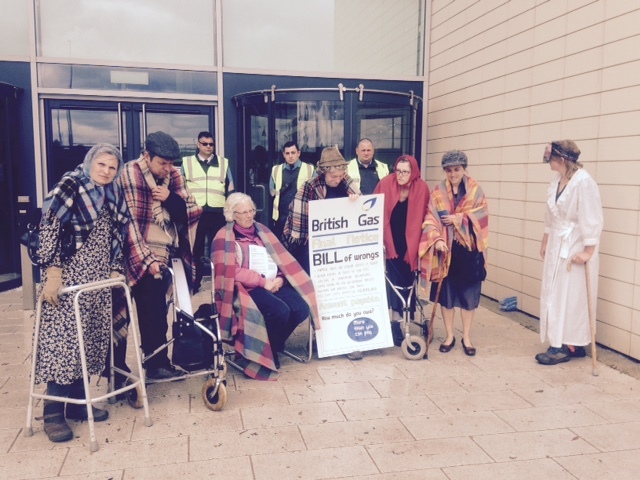 Environmental activists, dressed as shivering grannies, hand delivered to British Gas Headquarters a “Bill” for funeral costs for the thousands of customers who died from fuel poverty last year. Following a refusal of British Gas and all the ‘Big Six’, to decrease their prices in line with the 27% drop in gas wholesale prices last year, 15,000 people in the UK are estimated to have died because of cold homes. Given that 39% of the domestic energy market is British Gas, activists say the energy provider must be held to account. The activists are from the ‘Reclaim the Power’ group, who are holding a mass action camp in the shadow of Didcot Power Station. The activist’s ‘Bill of Wrongs’ includes costs for extra NHS expenditure, CE Iain Conn’s scandalous £3.7 million package, failure to meet their obligatory schedule for insulating homes, traumatising break-ins to install pre-payment meters, and charging the poorest customers the most. They have also delivered a copy of the Energy Bill of Rights, which asserts the right to affordable energy that does not harm the environment or exacerbate climate change. There are 6.6 million people suffering from fuel poverty in the UK . Fuel poverty disproportionately affects women and those over the age of 75. Public Health England have stated that indoor temperatures below 18 degrees damage physical and mental health, resulting in a significant increase in illness and mortality rates. Estimates from the World Health Organisation and Office of National Statistics indicate that almost 10,000 people died in 2013 due to cold housing in the winter months, resulting in an average of 65 deaths per day . Cold living buy genuine proscar uk conditions have been shown to directly adversely affect respiratory and circulatory conditions, in addition to mental health. Secondary effects of fuel poverty, including stress and burnout, have been shown to exacerbate chronic illnesses and contribute to the onset of disease in otherwise healthy individuals . Illnesses directly related to fuel poverty are estimated to cost the NHS 1.36 billion per year . Last year, British Gas took over £571 million pounds in profit. Despite these figures, British Gas were found to have overcharged 700,000 customers and to have forcibly installed pre-payment meters in homes, forcing some of the lowest income households to pay the most per unit of power . As the largest UK energy provider, BG has the power and money to address this humanitarian disaster. Reclaim the Power is a grass-roots organising network for taking direct action on environmental, economic and social justice issues, working in solidarity with affected communities. 3. World Health Organisation. 2006. Fuel for life: Household Energy and Health. World Health Organisation. [Online] Available at: http://www.who.int/indoorair/publications/fuelforlife.pdf Accessed: 31/05/15. 4. Butcher, J. 2014. Fuel Poverty: How to improve health and wellbeing through action on affordable warmth. UK HEALTH FORUM, PUBLIC HEALTH ENGLAND. [Online] Available: http://www.fph.org.uk/uploads/UKHF-HP_fuel%20poverty_report.pdf Accessed: 31/05/15.